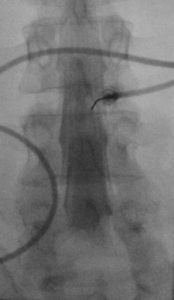 Myelogram is a radiographic test that is invasive. Radiographic dye is inserted via a needle into the patient’s spinal canal and then x-rays or CAT scans are then obtained after the injection of the dye. This test, although safe in most cases, has higher risks than MRI or CAT scan and was used much more commonly before the invention of MRI and CAT scan. However, it is still used in patient’s who cannot have MRIs and in cases where CAT scan fails to show enough detail around the spinal cord and nerves.